For Wordpress there seems to be a common pattern of modules having nag screens asking people to recommend, share or donate money for the plugin or them having ad’s embedded within them advertising support services, I’ve even see modules which litter the admin panel with multiple newsfeeds to try and get traffic back to their website. If I then contrast this with modules that I use in my Drupal site builds I don’t think I have ever seen anything like that, the normal place for this would be the module page on drupal.org where the user can find out more about the module and get help etc. Which brings out an interesting question, in that is Wordpress used primarily by users where Drupal is used primarily by developers? I did some googling to see if I could find any stats to this question but nothing obvious came up but if anyone knows of anything please contact me. 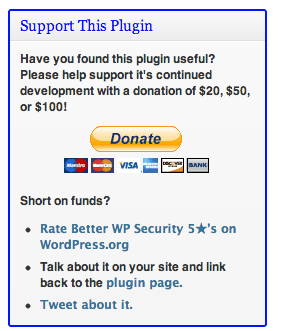 Being a contributor to open source projects for over 10 years I appreciate how hard it is to get people to donate to help continue development but something inside me feels like plastering plugins/modules with ad’s / requests for ratings feels wrong and also adding lots of HTML comments to the frontend of someone’s website advertising they are using your plugin/module also feels wrong, I feel that just having simple links to support pages in the admin panel should be enough and maybe offering a paid for “premium” version if funds are tight.